I hear it again and again as a personality blogger…”I thought I was so weird, so strange…and now it all makes sense!”. People who have felt like outcasts or oddballs their whole lives discover their personality type and suddenly years of confusion and frustration start to melt away. Suddenly someone doesn’t feel “wrong” because they perceive things differently than their parents did or their teachers did…suddenly an individual realizes that who they are is a beautiful thing! Sure, they’re not perfect. We all have our strengths and weaknesses. But it’s okay to be different – in fact, it’s good to be different and unique! INFJs tend to feel this relief in a very strong way. Because INFJs are such a small percentage of the population, it can be especially difficult for them to find like-minded friends and confidantes. Many times INFJs feel they have to “play a part” to fit in or form relationships. One of the greatest joys I’ve experienced as a personality blogger is seeing so many INFJs make peace with themselves, accept their strengths and see them AS strengths. I love seeing people embrace their “weirdness” and unique individuality and I hope that learning about your type can do that for you, too. So what makes INFJs “weird” and wonderful? What three unusual characteristics make them stand out? Let’s take a look! INFJs are dominant Introverted Intuitives. This means that every bit of information they take in is pieced together into a “vision” or insight into what will take place in the future. This foresight tends to appear “out of the blue” in a sudden moment of realization and clarity. This all sounds very magical and mysterious, but there’s a science behind it. You can find out more about that here. This ability to spot future possibilities makes INFJs strategic, creative, and sometimes mysterious. INFJs are wired to see patterns, symbols, strategies, and future implications. Because they are so constantly in this mental state it can seem like they are “psychic”, but it’s really just the way they are used to seeing the world and perceiving the data around them. Each personality type is wired to notice different things. As an example, ESTPs, are highly attuned to the moment and incredibly in touch with current details. They have faster reflexes than most people, and notice more minute details than other types. They are extremely in tune with the present. INFJs, in contrast, are incredibly attuned to anything that would imply something for the future, anything that would change or alter future events. Everything is seen in the context of how it will play out someday. As a result, INFJs are quicker to pick up on future outcomes or transformations than most other types. One of the lesser spoken-of qualities of Introverted Intuition is the ability to discern hidden motives. As Ni-dominant types, INFJs are quick to grasp the intentions and underlying goals that other people are aiming for. INFJs are drawn to complexity and rarely accept anything at face-value. For that reason, they naturally look for the deeper motives and intentions of other people and are always trying to “peel away the layers” of someone’s personality type and find their core purpose, desires, and truth. The INFJ sees the outer persona, the appearances, and the surface-level interactions of others, but they are more focused on what’s going on behind the scenes. They are always trying to figure out the deeper meanings behind why people say or do the things they do. 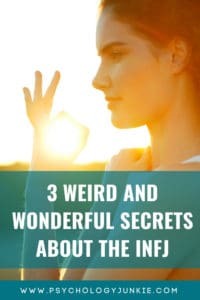 The strength of intuition paired with the INFJ’s auxiliary function, Extraverted Feeling (Fe), gives them a special awareness of the emotional health or mood of people. They often get a sense of how other people are feeling, even when those people are trying to keep their emotions hidden. They have a tendency to absorb other people’s emotions into themselves, which can be confusing at times. It can be easy for them to get other people’s emotions mixed up as their own. INFJs are extremely concerned with maintaining morale and making sure that everyone feels welcome and at home in their presence. They want to maintain harmony in whatever social realm they’re in and will go to great lengths to ensure that everyone’s emotional needs are met. As a result, they tend to appear much more outgoing socially than they really are. They may speak up during awkward silences or use humor to diffuse tense moments. They tend to speak to people they feel are left out and try to make them feel welcome. Many INFJs will poke fun at themselves or use self-deprecating humor to ease the tension in the room or help someone who is feeling shy or uncomfortable. INFJs need a lot of alone time to process information, to get in touch with their intuition, and to reflect. They can get frustrated when they have to socialize a lot because they end up relying much more on their auxiliary feeling function than their dominant intuition. Over time, this can leave them feeling overwhelmed and drained. Ni is notoriously difficult to access in social settings, and, like all types, INFJs are most happy when they can tune into their dominant function. As a result, INFJs may feel the need to “disappear” regularly to recharge and get back in touch with their insights and ideas. You might see INFJs referred to as “the most extraverted introverts” in articles and personality forums. And while this is true in one sense, it couldn’t be more false in another. While INFJs can appear very extraverted socially, they need quite a lot of alone time and actually get exhausted much faster than many other introverts do in social settings. This is largely because they can get so caught up in maintaining everyone else’s morale that they lose sight of their own needs. Do you relate to these “weird” INFJ qualities? Share your thoughts with us in the comments! Want to discover your true potential as an INFJ? 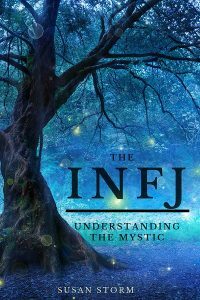 Check out my latest eBook, The INFJ – Understanding the Mystic. This book is packed with in-depth information on the INFJ personality type, as well as relationship tips, career tips, parenting tips, and more! As a child I was always buying newspapers with my pocket money. I wanted to know what was going on in the world. I would always watch the news on tv. By the age of ten years old my head was full of so much knowledge stored in my head i knew who was who and what was happening or had happened in the world. BUT !!! I was never that academically strong. Ha! I’m 61 and I just found out I am an INFJ a couple of months ago! It all makes sense now! Still have residual depression and social anxiety, but it is much easier to manage since I have given myself permission to be me. Thank you Susan! The section about how INFJs often seem like extroverts… Describes who I am at work to a tee!! It’s like you were there watching me! Lol 🙂 When I read how infjs want other people to feel welcome and at home in their presence, I thought yes that is exactly how I feel! Most of the time I would rather work quietly & not talk out loud when I’m at work (or church, at a family gathering, etc)… I usually feel stressed or like I am not being myself when I do speak up & share my thoughts… but I often find myself feeling a need to break a silence at work to be sure no one feels lonely or uncomfortable. That is so true!! I will also often answer someone’s jibber jabberring (I mean that in a nice way, it’s not necessarily a bad thing…) because I know no one else is comfortable enough or able to listen enough to answer the person back… And because of the nature of things, this sometimes happens especially with people who are more blunt or rude in their manner of speaking… I want so badly to avoid them, yet I cannot bear to watch the thoughts they have expressed fall to silence… Even though I can’t stand rudeness, at the same time I don’t want anyone to feel ignored or unappreciated. Lol 🙂 I guess I fit the infj category pretty well!! Thanks for your posts, I so enjoy your blog!